Originally posted: September 8, 2018 . Last modified: February 22, 2019 . These fluffy American pancakes are pillowy, moist, and buttery. 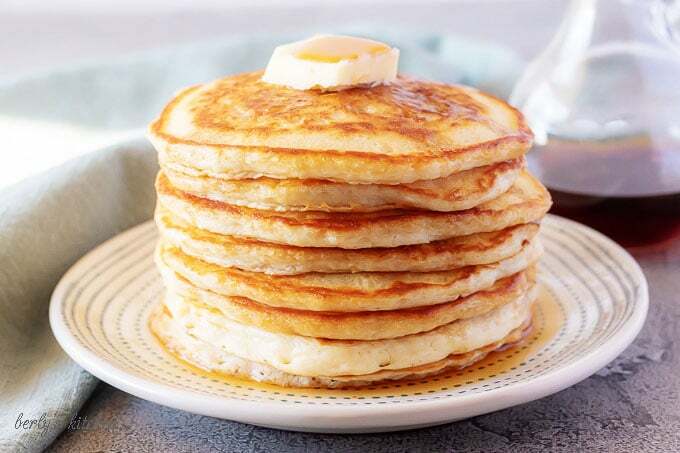 Each pancake is cooked to a perfect golden brown with a crispy, crunchy edge. I LOVE, LOVE, LOVE fluffy American pancakes. I have an entire Pinterest board dedicated to this breakfast favorite. Maybe I like them so much because I’ve been eating them for 35+ years. John is also a huge fan of pancakes, too. (Although, I think he prefers French toast!) When combined with a little butter and real maple syrup, it’s a meal that cannot be missed. We used to go out and eat them all the time at a well-known pancake house. However, as the years have gone by, John started to prefer mine over the restaurant versions. With that being said, I don’t get to make them as often as I like. 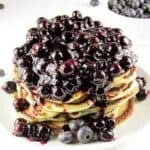 But when I do, this fluffy American pancakes recipe is the only one I use. They are my absolute favorite. Furthermore. I hope you give this recipe a try. Hopefully, you will enjoy them as much as we do in our household. How about we get started?! First, start by making the batter. Simply, combine all the ingredients in a stand mixer and blend until well combined. The batter should still be smooth and not overly thick. Next, you can place the batter in your fridge to rest while you preheat a skillet over medium heat. 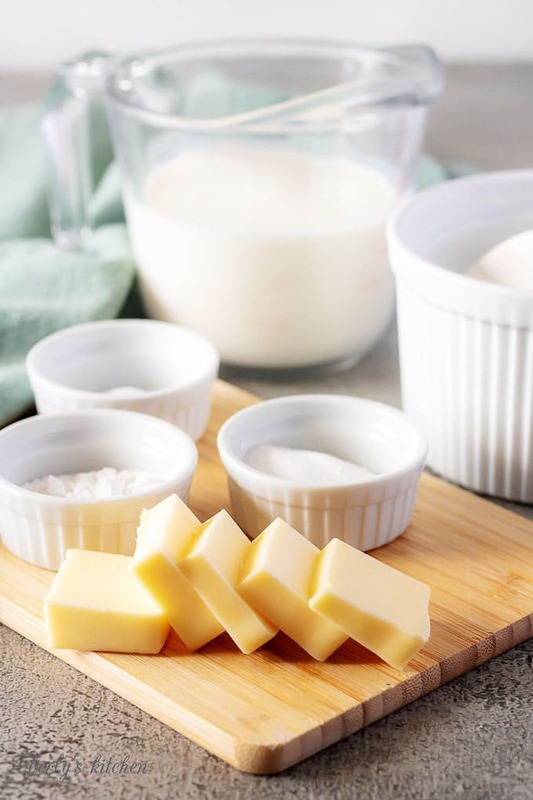 Now, refrigerating the batter is optional, so feel free to leave it out on the counter while you prep the skillet for cooking. After that, once the skillet is warm, melt one tablespoon of butter in the pan. It should only take a few seconds for the butter to melt. Sometimes, I will lift the skillet off the heat and tilt it back and forth so the butter forms a nice even coating of fat. This action will create a crispy crust on the fluffy American pancakes and it tastes delicious! 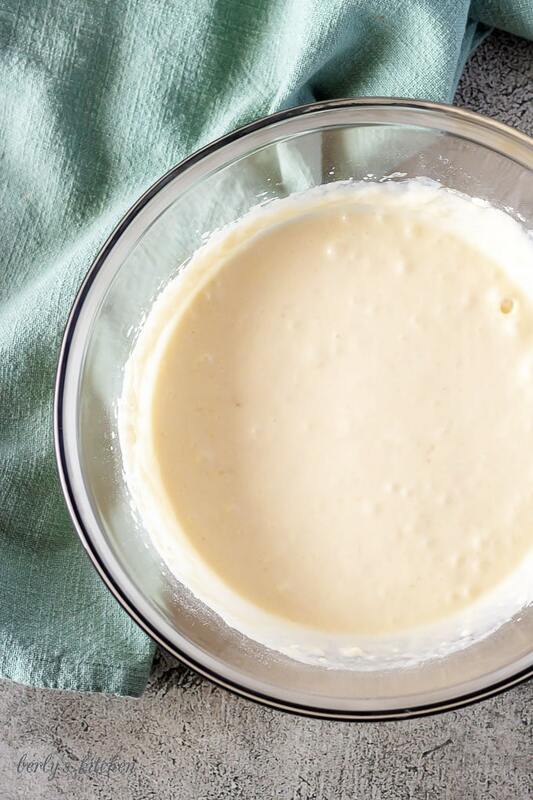 Then, remove the batter from your fridge and using a measuring cup to pour 1/4 cup of batter into the hot pan. 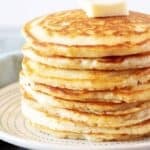 Feel free to use a larger measurement, while it may increase the size of your cakes, it will reduce the number of pancakes this recipe makes. Now, let the pancake cook on one side until you see bubbles form in the batter and the edges begin to crisp. Once you see those things happen, you know the pancake is halfway done. Go ahead and flip the cake and allow it to cook for an additional 1-2 minutes. Last, remove the fluffy American pancake from the pan and repeat the process until all the batter is gone. Be sure to serve them with butter and maple syrup or honey. Also, you could use a fruit topping as well. I believe we have at least two different toppings on our website to choose from including strawberry, blueberry, and a simple lemon pastry filling. Make sure to mix the batter well so there are no lumps. 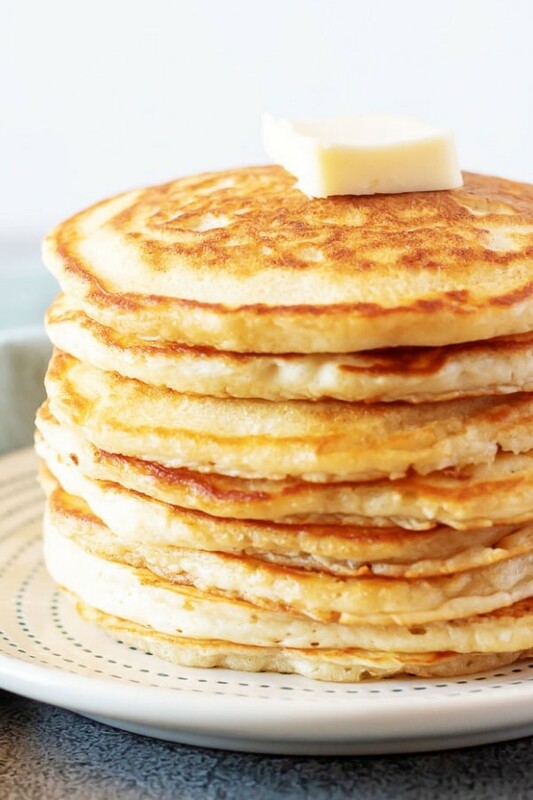 Melted butter in the pan helps fry the edges around the fluffy American pancakes. You can use these pancakes to make breakfast wraps loaded with bacon, eggs, and sausage. Use a stand or hand mixer to combine all ingredients. The batter should be smooth and not too thick. Place 1/4 cup of batter in skillet and cook until bubbles begin to form. The calories listed are an approximation based on the ingredients and do not include the additional butter and syrup. Actual calories may vary. Makes 5 servings of 2 pancakes per serving. 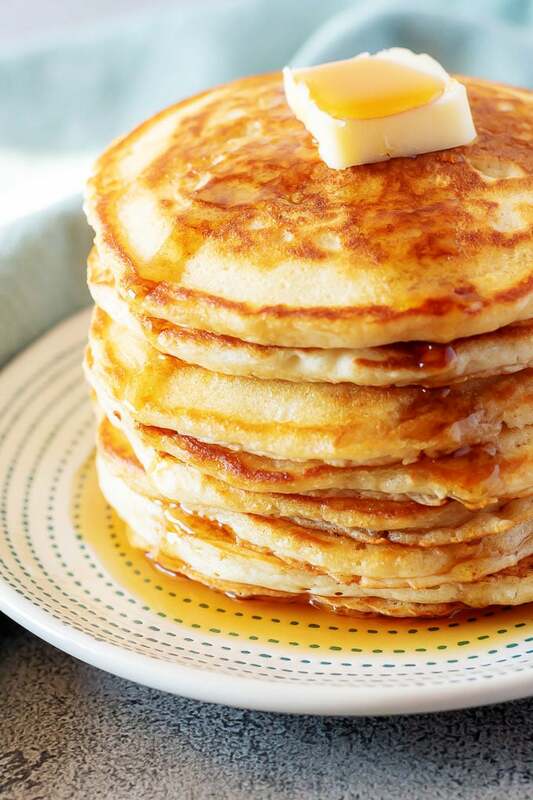 Pancakes are approximately 5 - 6 inches in diameter. Ok i have to admit…I’ve stopped ordering pancakes at restaurants because no one makes them with the buttery crust around the edges like I do at home so why bother?! But I see that you have the crust too! It’s so refreshing to see the crust on pancakes other than my own. It add so much flavor so I don’t know why more people don’t do it. Bravo!! Thank you, Sharon! Exactly!! Glad to know there is someone else out there that doesn’t like mushy pancakes. They have to be cooked in butter in a preheated pan or griddle in order to be awesome. Then you have that delicious crust around the edge 🙂 We are happy to meet another kindred spirit in the land of pancakes LOL! 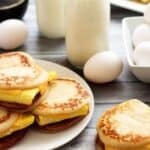 breakfast is my weakness and these look so amazing!